Posts relating to the Native American Kanistanaux Family known in Stockton, NY. I don’t anticipate this exercise will provide any real clues to Dr. Lee-o-netto’s parents, but with many research problems it can provide useful information. I encourage my readers to learn all you can about the locations your ancestors lived. If the building still stands, maybe there is treasure in a dark attic corner. I like to take these little site-seeing excursions. They help me understand the environment the subject lived and worked within and in turn that helps me get to know my research subject as a person. First I would like to apologize to my readers for my long absence. It seems life and responsibility keep getting in the way of my research. I do have records to share, but recently have not been able to set aside the blocks of time needed for the background research and post writing. I am not giving up the blog, but it looks like this situation will continue until after the holidays. Posting will be erratic for a while longer so please, bear with me. 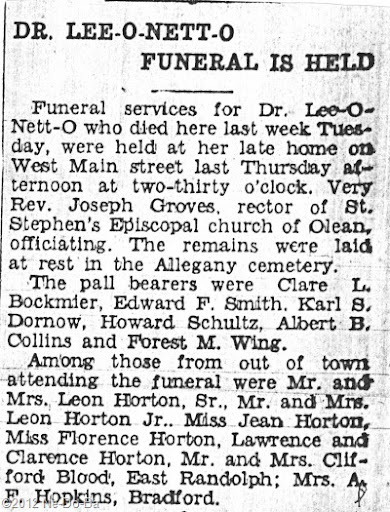 Today I am exploring Mrs. C. B. Mosman who filed a claim against Lee-o-netto’s estate stating she provided “work, labor, and services” to Dr. Lee for 26 years without pay. I need to investigate this woman and her family on the off chance someone is related to Lee-o-netto in some way. Good research requires numerous side trips to explore all the people connected to our research subjects. I recently noticed some genealogy folks referring to this research technique as “cluster genealogy”. Now it has a fancy name, but I just think of it as common sense research. When you are looking for something – look everywhere it could possibly be!